Miss Fancybelle: Cabo Halter Day 4: All Done and Pattern Review! Amy Butler Lotus Top Sew-a-Long! My Amy Butler Shower Curtain! 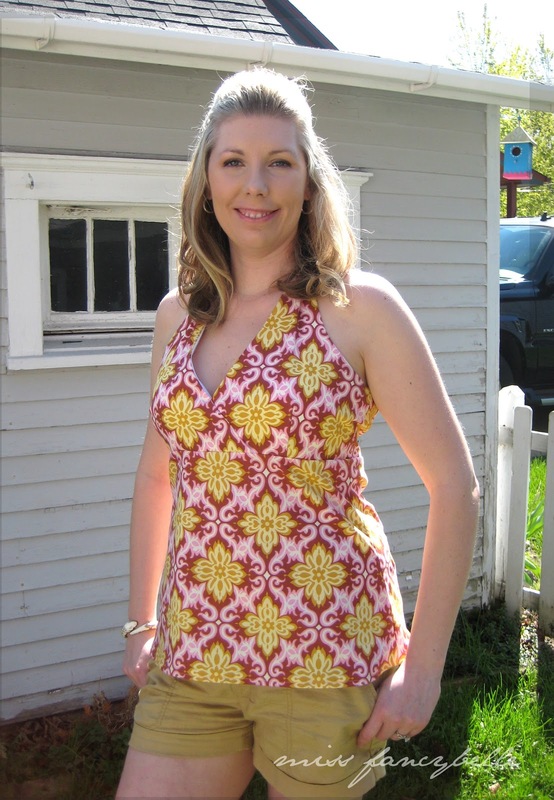 Cabo Halter Day 4: All Done and Pattern Review! Cabo Halter Day 3: Zipper, etc. 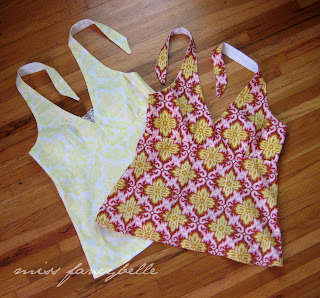 It's been just a blast doing the Amy Butler pattern sew-a-long via the Living with Punks blog! Big thanks to her for arranging this and getting me sewing something just for myself! It's been so enjoyable and motivating that a friend of mine and I have decided to do the Amy Butler Lotus Tunic pattern together next!!! Check out her blog: My Little Ladies. For even more pics of everyone's projects, click HERE to see the Sew-a-Long Flickr group. Here are photos of the completely finished garments! If you've used paper patterns before, this pattern won't give you much trouble. I made two of these halters in a little less than 4 days, during evenings and my kids' naptimes. I found that the pattern pieces were very fully and accurately labeled, which made assembly a little easier. Amy Butler's step-by-step descriptions were largely adequate and assembly was very straightforward. It would have been nice to have a few extra drawings about how to construct the dart, especially for first-timers, but it wasn't an issue for me because I had sewn them in previous garments. The Cabo Halter pattern was pretty much true to size for me. After comparing my measurements to the pattern instructions, I chose to sew a size large and I'm glad I did! If anything, this pattern runs a tad small in the bodice. If you are more well-endowed, I'd suggest cutting the bodice pieces a size up from your body pieces. Actually, this pattern call for a 1/2" seam allowance throughout, which is more than generous to allow for extra sizing tweaks. On my second halter (Temple Garland), I made the bodice pieces using a 3/8" seam allowance, but kept the 1/2" allowance for the body. I think the fit of that garment worked out best for my body type. Another note about the bodice...I decided to add a few stitches where the two bodice pieces cross over just to minimize the cleavage effect. I even added some lace to the yellow halter's bodice area to obtain more coverage. For more details on how to make this top more modest (so to speak! ), check out some ideas from the Living with Punks blog HERE. Hi there! I'm a Midwestern mom of 3, sewing & knitting enthusiast, Murder She Wrote addict - I just love all things handmade, vintage and shabby chic. So glad you are here!